Clean the chicken, season it with some allspice, salt, pepper; brown it in a couple of tablespoons of oil in a large Dutch oven as well as the large onion. Pour 8 cups of water over the chicken, add a cinnamon stick, bay leaf and carrot, and let it simmer gently for at least one hour, skimming the froth at the surface. This step could be done the day before. Peel and brown the small boiling onions in some oil (or better yet, clarified butter)until the onions are evenly browned on all sides. Strain the chicken, keeping the bouillon simmering gently in a large pot or saucepan. Add the chickpeas and boiling onions and half the spices to the chicken bouillon. Take apart the chicken, dumping bones and skin; cut the chicken meat into large pieces and set them aside on a plate. Boil the moghrabieh in a large pot filled with salted water for 10 minutes. Drain and rinse under cold water. Heat a couple of tablespoons of oil or butter and fry the moghrabieh in the oil on very low heat, adding the rest of the spices for 5 minutes. Gradually add to the moghrabieh several ladles of chicken bouillon (about 2 1/2 cups) and keep over low heat simmering gently and stirring the moghrabieh from time to time with a wooden spoon until the grains feel soft and thoroughly cooked, about 20 minutes (make sure to taste it and do not overcook it). Add to the moghrabieh one cup of the chickpeas and one cup of the small boiling onions, leaving the rest for the sauce. Boil down the remainder of the broth until you have 3 cups left; add about 3 tablespoons of cornstarch diluted in a little water to the steaming broth and stir to thicken it. Keep a few chickpeas and onions in the sauce and serve in a separate saucer with themoghrabieh. Serve the moghrabieh with the chicken pieces, chick peas and onions and have the warm sauce available in a separate saucer. This is the Lebanese equivalent of couscous, aptly called moghrabieh. It is a much-beloved traditional dish in Lebanon and is considered a feasting type of meal to which many relatives or friends are invited. It used to be made with both lamb shanks and chicken but nowadays most people prefer a streamlined version with only one or the other. It can be purchased fresh in Beirut (at places like Al-Rashidi); outside of the country, it is sold dry in any Middle-Eastern market. It refers to both the grains and the finished dish. 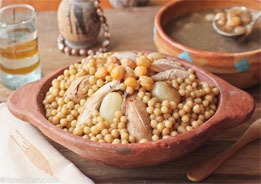 This dish involves two main steps: The first is to cook the chicken (or meat) and the onions and obtain a good bouillon which will be used to cook the moghrabieh grains. The second is to cook themoghrabieh grains in the bouillon. It keeps very well in the fridge for several days without loss of flavor and can be reheated in the microwave.